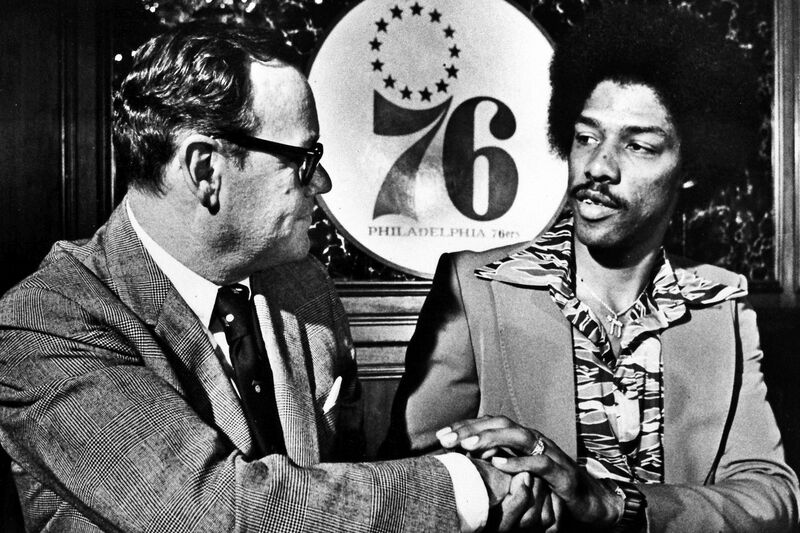 Fitz Dixon (left) bought the 76ers in 1976 for about $8 million. Months later, he acquired Julius "Dr. J" Erving for another $6 million. Fans thought it was the start of something great. But it didn't turn out that way. Second in a six-part year-long series about the best local teams that never won a championship. Today: 1976-77 Sixers. Coming in June: the 1977 Phillies. Amid all the flipping of bats and lids surrounding the 2019 Phillies and their free-agent-stuffed lineup, the tumultuous saga of the 1976-77 Sixers should stand as a cautionary tale. The NBA’s highest-flying and highest-paid team, one so laden with talented and colorful stars that it provoked the normally staid New York Times to declare “there has never been a team like the 76ers and there may never again be another,” failed to win a championship. In fact, their season was so turbulent and unexpectedly disappointing that it prompted a summer-long apology from the organization. The 76ers’ infamous “We Owe You One” ad campaign backfired as the debt went unpaid in 1978 and beyond. The slogan has endured, though, as a mocking epitaph for a team virtually conceded an NBA title when Julius Erving arrived in a hail of Bryce Harper-like hoopla two days before the 1976-77 season. The signing of Erving, 26, a three-time American Basketball Association MVP whose athleticism was transforming basketball, created some of the loftiest expectations ever in Philadelphia sports. He joined an already gifted roster that included the previous year’s headline-grabbing acquisition, George McGinnis, as well as Doug Collins, Darryl Dawkins, World B. Free, Steve Mix, and Henry Bibby. “Everybody looked at our team and said we shouldn’t lose a game,” said Bibby, now retired in California. So, of course, they lost their first two. While they captured the division title and compiled the league’s second-best record, the 1976-77 Sixers are remembered 42 years later more for what they failed to accomplish. They were, as a unit, less than the sum of their entertaining and expensive parts. Julius Erving didn't practice with his Sixers teammates before his first game in Philly. It was a sold-out loss at the Spectrum. Erving, the elegant skywalker, was a revolutionary figure. The chiseled McGinnis was a forerunner of the muscular modern forward. The self-indulgent Lloyd Free, not yet World B., had a 44-inch vertical leap and nicknamed himself the Prince of Mid-Air. The free-spirited Dawkins wrote poems, shattered backboards and bathrooms, and infuriated coaches. Joe “Jellybean” Bryant was an all-league character. So was Caldwell Jones, who once said his favorite seafood was “saltwater taffy.” Four of them — Bryant (Kobe), Bibby (Mike), Mike Dunleavy (Mike Jr.), and Harvey Catchings (Tamika) — would father future basketball stars. While they never meshed, on or off the court, their individual abilities were enough to earn them a 50-32 record and a six-game margin over Boston in the Atlantic Division. They ousted the Celtics and Houston in the playoffs, and when they took a 2-0 lead over the Trail Blazers in the Finals, the hype seemed validated. Then the Trail Blazers rained on their parade, winning the next four games. Philadelphia couldn’t overcome the constant turmoil, a prolonged McGinnis slump, the emotional spark Portland derived from a Game 2 brawl, and, maybe most important, the weight of expectations. Gene Shue (right) was tasked with keeping Darryl Dawkins (left) and the rest of the Sixers cast happy. The best 76ers team that didn’t win a title couldn’t — or wouldn’t — grasp one of sports’ basic principles: Great chemistry often trumps great talent. Lloyd Free, now known as World B., fights for a loose ball during a February 1977 game against the Lakers. Free wasn't happy with his playing time under coach Gene Shue. And then there was Sunday, March 13, 1977, when a bombshell, lobbed by the most unlikely enemy, landed in the midst of their dysfunction. That morning, a pointed essay by Erving’s wife, Turquoise, appeared in the New York Times. The star’s unhappy spouse alleged, among other things, that their welcome to Philadelphia had been chilly at best, that her husband’s selfish teammates didn’t get him the ball enough, that no one respected Shue, and that these 76ers would not win a championship. Curiously, the broadside energized the Sixers. After losing to Chicago in a turbulent haze that Sunday afternoon, they won nine of 10. Just four years earlier, the 1972-73 Sixers had won only nine games while losing a record 73. That ineptitude, however, helped in the draft. They got Collins, a 6-foot-6 guard, with the No. 1 overall pick in 1973. With the No. 5 overall pick two years later, they selected Dawkins, a quixotic 6-11 Florida high-schooler. Free came in the second round in ’75. Doug Collins (right) was the Sixers' first pick in the 1973 draft. Financially troubled teams in the ABA and NBA provided more help. Bibby was purchased from the cash-strapped New Orleans Jazz. Jones, the Sixers’ starting center, arrived from the ABA after a 1976 merger killed all but four of that league’s teams. One of the survivors was Indiana, where McGinnis had averaged 29.8 points and 14.3 rebounds in the previous two seasons. When the Knicks tried to lure the 6-8 power forward to the NBA, the 76ers, who’d drafted him in 1973, owned his NBA rights and weren’t letting him go without a fight. Team owner Irv Kosloff and the Sixers eventually won the dispute, and McGinnis, like Erving a year later, signed a six-year, $3 million deal. He immediately brought respectability and excitement to a franchise that recently had lacked both. Suddenly “Let George Do It!” billboards appeared everywhere and attendance virtually doubled. For McGinnis’ 1975 home debut, a Spectrum-record crowd of 18,029 turned out. George McGinnis helped lead the Sixers to 12 more wins and a playoff berth in 1975-76 before teaming with Julius Erving. With McGinnis, the ’75-’76 Sixers improved immediately, from 34-48 to 46-36, and earned a playoff berth. But they were upset in the first round by the Buffalo Braves — losing the deciding game at home. It was the first of two straight years a team led by former 76ers coach Jack Ramsay would eliminate them. That offseason, Sixers officials began to hear rumors. The Nets had refused to renegotiate Erving’s seven-year, $1.9 million contract and he wanted out of New York. Williams phoned Nets GM Bill Melchionni, a former 76er, to express interest. The two kept in touch that summer. Melchionni told Williams the Nets wanted $3 million and Erving the same amount spread over six years. “That was a lot of money in 1976,” Williams said of a season in which the average NBA salary was $130,000. Dixon, the heir to the Widener fortune, had purchased the Sixers the previous May from Kosloff for $6.2 million. Now he would be asked to spend almost that much for a single player. Williams drove to Dixon’s Montgomery County estate, Erdenheim Farm, to explain the opportunity. “Who’s Julius Erving?” the owner asked. Julius Erving, with his soaring dunks and "Dr. J" moniker, had fans all over the country flocking to see Sixers games. Once informed, Dixon agreed. Soon Williams and lawyers were dispatched to New York. Negotiations involving the 76ers, Nets, and Erving’s agent (Irving Weiner) lasted all night. When they were successfully completed on the morning of Oct. 20, the Sixers’ party celebrated with breakfast, appropriately enough for the Dixon era, at Manhattan’s Yale Club. The signing of Erving, whose Dr. J. nickname and soaring dunks had made him a national phenomenon, ignited Philly’s passions. An overflow media crowd attended his introductory news conference later on Oct. 20. Two nights later, without having practiced with or even having met his new teammates, Erving debuted in a loss to San Antonio at the sold-out Spectrum. The next night, the team that Inquirer beat writer Bill Livingston labeled “the best money can buy,” lost again in Buffalo before the first in a string of road sellouts. (“I don’t think we played to an empty seat on the road all year,” said Bibby.) Already there were locker-room concerns about unpreparedness. Henry Bibby takes the ball to the net against the Nets in November 1976. Bibby became part of a starting rotation featuring Dr. J, George McGinnis, Caldwell Jones and Doug Collins. Ironically, it wouldn’t be until ’77 that the 76ers found a stride and a workable starting five — Erving, McGinnis, Jones, Bibby, and Collins. When they defeated the Celtics, 91-83, in Boston on Jan. 23, they’d won 10 of 11 and opened a seven-game divisional lead. A day later, Erving, McGinnis, and Collins were named All-Star Game starters. An April 1 win over Kansas City pushed them to a season-best 20 games over .500. But they finished the regular season unimpressively, losing four of their final six. After a first-round playoff bye, they met Boston. In Game 7 of that series, Erving, McGinnis, and Collins combined for only 32 points and Philadelphia made just one field goal in the last 8 minutes, 24 seconds. Yet somehow the Sixers survived, 83-77. It was the franchise’s first playoff-series win since 1968 and players and fans celebrated. Dunleavy cut his head when he jumped into a locker-room door jamb. Bibby gleefully told reporters Boston had “choked” and that “Celtic pride didn’t come through.” An impromptu celebration outside the Spectrum led to the arrests of several fans. Still, even in victory, there were signs of danger ahead. The 76ers, claimed Boston’s John Havlicek, played too much “one-on-one” — a charge 76ers assistant coach Jack McMahon felt compelled to respond to. They had enough plays to eliminate Houston in a six-game conference final series. Then came Portland, where Ramsay, a healthy Bill Walton, and Maurice Lucas had invigorated the seven-year-old franchise. For the 76ers, the Finals would be a blur of injuries, missed shots, and even more controversy. The turning point might have been a wild Game 2 fight that inflamed the Blazers and exposed the Sixers’ dysfunction. George McGinnis (right) and the Trail Blazers' Maurice Lucas were supposed to go head-to-head in the 1977 NBA finals, but it was Lucas and Darryl Dawkins who ended up coming to blows. Philadelphia took the first two games at home. But McGinnis, who’d averaged 21.4 points a game, was slumping badly. Late in Philadelphia’s 107-89 Game 2 victory, Dawkins and Portland’s Bobby Gross scrambled on the floor for a loose ball. The two came up swinging wildly, one of Dawkins’ punches clipping teammate Collins in the jaw. Lucas rushed in and belted Dawkins from behind. Coaches, players, security personnel, and fans hurried to the scrum. One fan punched a Blazer from behind. Erving, meanwhile, sat alone at midcourt, a bemused god observing these foolish mortals. Afterward, Lucas bemoaned Dawkins’ “gorilla” tactics. Teammate Lloyd Neal called the fans who rushed the floor “psychos.” Gross accused Philadelphians of stealing four or five warm-up jerseys from the Blazers’ bench. “I don’t think that sort of thing would happen in Portland,” said Gross. Darryl Dawkins (left) and Maurice Lucas shake hands after returning from one-game suspensions during the NBA Finals. Suddenly the Blazers were energized. Back in Portland, they won Games 3 and 4 by 22 and 32 points, respectively, their 16th and 17th consecutive home victories. The Sixers returned to Philly desperate for a win, though not desperate enough to come together. During a typically ragged scrimmage two days before Game 5, some teammates shouted, “Brick! Brick!” whenever the struggling McGinnis took a shot. An ongoing feud between Bryant and Mix worsened when Bryant said he could outplay his teammate “any day of the week.” In the Inquirer, Livingston accused Shue of being “unable to restore a higher sense of professionalism.” And Dawkins composed a poem. Portland triumphed at the Spectrum, 110-104. Erving had 37 points but the maligned McGinnis only 11 on 3-of-9 shooting. Ramsay’s disciplined style had exposed the 76ers’ lack of cohesion. Portland's Bill Walton shoots over Julius Erving during the Sixers' Game 5 loss at the Spectrum on June 4, 1977. In the closing seconds, Erving (40 points), McGinnis (28), and Free all missed potential game-tying shots in a 109-107 loss. Amid the postgame gloom, Shue refused to second-guess himself. But when Philadelphia started the following season 2-4, he was fired and replaced by Billy Cunningham. The ubiquitous “We Owe You One” campaign continually reinforced the disappointment. Team spirit improved noticeably under Cunningham in 1977-78. The 76ers went 55-27 and won another division title, but a loss to Washington in the conference final reignited the pessimism. Attendance fell by 3,500 a game the following year and stayed depressed. Players from the ’76-’77 roster began to drift away slowly, like colorful autumn leaves from a tree. McGinnis and Free left after the ’78 season. Joe Bryant was gone in ’79; Bibby in ’80; the injury-riddled Collins in ’81; Dawkins, Jones, and Mix following the ‘82 season. By the time the 76ers finally won a title in 1983, only Erving remained. It was only then that the “We Owe You One” references stopped. “When our advertising people came up with that, I thought it was quite clever and effective,” said Williams. “Except that the next year we got knocked out by Washington and we began to hear, 'Now you owe us two.’ And it went on like that year after year. JULIUS ERVING: Acquired in October 1976 from the cash-strapped New York Nets after the NBA absorbed them and three other American Basketball Association teams. DOUG COLLINS: The Sixers’ first pick (first overall) in the 1973 NBA draft. GEORGE McGINNIS: After four ABA seasons, he signed as a free agent with Philadelphia in July 1975. DARRYL DAWKINS: The Florida high-schooler was the 76ers’ first-round pick (fifth overall) in the 1975 NBA draft. WORLD B. FREE: The Sixers’ second-round pick in the 1975 NBA draft. STEVE MIX: Signed as a free agent in August 1973. JOE BRYANT: The 76ers acquired Kobe’s dad from the Golden State Warriors in September 1975. CALDWELL JONES: Drafted by the 76ers in 1973 but playing in the ABA at the time, Jones signed with Philadelphia as a free agent in February 1975. HENRY BIBBY: Acquired from the New Orleans Jazz in September 1976. FRED CARTER: Acquired in 1971 from Baltimore along with Kevin Loughery for Archie Clark and a second-round pick. Was dealt to Milwaukee in December of the 1976-77 season. MIKE DUNLEAVY: The Sixers’ sixth-round pick in the 1976 NBA draft. HARVEY CATCHINGS: The Sixers’ third-round pick in the 1974 NBA draft. JIM BARNETT: Signed as a free agent in January 1977. TERRY FURLOW: The Sixers’ first-round pick (12th overall) in 1976 NBA draft.